Be the first to share your favorite memory, photo or story of Jovina. This memorial page is dedicated for family, friends and future generations to celebrate the life of their loved one. 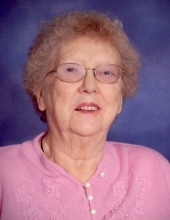 Jovina Mary Lechtenberg, age 82 of rural Lawler, IA, died Tuesday, February 5, 2019, at MercyOne in Mason City. A Mass of Christian Burial will be held 10:30 a.m. Tuesday, February 12, 2019, at Assumption Catholic Church, Little Turkey. Interment will be in St. Mary's Cemetery, Little Turkey with Kari Elder, Tony Tillman, Jamie Lechtenberg, Brad Lechtenberg, Jen Larsen, Kelly Bailey, Jason Lechtenberg, Melissa Larsen, Chris Lechtenberg, Tracy Lechtenberg and Nick Lechtenberg serving as pallbearers. Honorary pallbearers will be Jovina's great-grandchildren. Friends may greet the family 4:00 - 8:00 p.m. Monday, February 11, 2019, at the Hugeback Johnson Funeral Home in New Hampton where there will be a 3:30 p.m. Rosary and a 7:30 p.m. Scripture Service. Visitation continues 9:00 - 10:00 a.m. Tuesday at the funeral home in New Hampton. Jovina Mary Lechtenberg was born October 23, 1936, in St. Lucas, Iowa, the daughter of Herbert and Frances (Rasing) Tillman. She attended school in St. Lucas and was a 1954 graduate of the St. Lucas High School. Jovina met the love of her life, Robert Lechtenberg, through a mutual friend after high school. The couple was married on October 8, 1955, at St. Luke's Catholic Church in St. Lucas. To this union, six children were born. Jovina worked at Sara Lee in New Hampton for most of her life. She worked there with her son Daniel and enjoyed her time there. After over 25 years she retired. When she retired Jovina helped her husband Robert with his woodworking. Together they would build wooden trucks, tractors, along with many other items. In her free time, she enjoyed playing cards, crocheting, canvas work along with baking and cooking. Jovina was a long time member of the Catholic Daughters of America and belonged to the Assumption Catholic Church in Little Turkey for most of her life. Jovina loved all the family functions and especially loved spending time with her grandchildren and great-grandchildren. She was preceded in death by her parents; two sons, Duane and Kevin Lechtenberg; two great-grandchildren, Sydney and Hunter; one brother, Leonard (Charlene) Tillman; four sisters, Adella (Wilfred) Tieskotter, Regina (Roman) Tieskotter, Bernadine (Andrew) Tieskotter, Lucille (Edwin) Lechtenberg. To send flowers or a remembrance gift to the family of Jovina Mary Lechtenberg, please visit our Tribute Store. "Email Address" would like to share the life celebration of Jovina Mary Lechtenberg. Click on the "link" to go to share a favorite memory or leave a condolence message for the family.